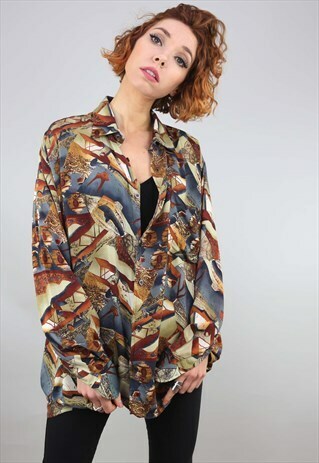 Vintage oversized long sleeve patterned shirt. Viscose material. SIZE: Will fit girls up to size 18 depending how oversized you want to wear it. (our model is size 6-8, 5'4" for reference) CONDITION: Excellent. This item is vintage and signs of natural wear & age are to be expected. One size. Can fit various sizes depending on your desired look e.g. oversized or fitted etc DELIVERY: UK delivery is first class Royal Mail and dispatched next working day. International shipping is tracked. UK express delivery is not available at weekends. MEASUREMENTS: Chest 50" Length 30"